Seven generations of the Bosc family have been born into our way of life. You might say it’s in our blood. In fact, they even live on the farm. Château des Charmes was founded in 1978 by Paul Bosc, a fifth generation French winegrower. Paul and his young family arrived in Niagara with the idea that growing our own grapes was the best way to make fine wine. More than ever, we believe in this Estate Winery model and we make our wine only from grapes we’ve grown ourselves. When Paul arrived in Niagara he just knew this place was special. The glacial soils, warm days and cool nights and the lush countryside reminded him of Burgundy where he studied oenology and viticulture at the University of Burgundy at Dijon. Today the Bosc family farms four vineyards in Niagara-on-the-Lake, located in two distinct sub-appellations – St. David’s Bench and Four Mile Creek. The Boscs believe they are custodians of the land. From the beginning they have been committed to using sustainable practices and are charter members of Sustainable Winemaking Ontario. Paul, Amélie and their team are meticulous. They use modern science and a lot of TLC to coax the best out of every vine. Amélie holds an MSc. in Biotechnology from Institut Sup’Biotech de Paris with a focus on wine research, specifically grapevine and yeast genomics. As well she is a graduate of the University of Montpellier, France with a MSc. in Viticulture & Oenology; the prestigious ‘Diplome National d’Oenologue’. Amélie’s experience includes cool climate winemaking in Alsace, France. 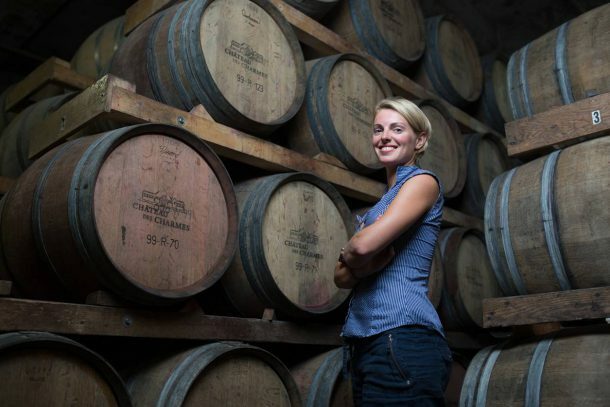 In 2011 she was introduced to the Canadian wine industry while working on research at the University of British Columbia’s Wine Research Centre and quickly fell in love with our country. With a passion for making wine in the new world, Amélie began working with Canadian wine industry pioneer Paul Bosc at Château des Charmes in Niagara-on-the-Lake. Paul quickly recognized her talent and saw a little of himself in her constant quest to learn and find new and more effective ways to make great wine. Paul was convinced that Amélie could take over the winemaking reins at Château des Charmes and officially named her Winemaker and Director of Oenology. With this strong vote of confidence and Paul’s continuing mentorship. Niagara is the largest and most diverse grape growing area in Canada. It’s shaped like a pizza slice; at its narrowest in the west and widest in the east. The northern edge is the shore line of Lake Ontario. To the south is the Niagara Escarpment and to the east is the Niagara River. Together these significant features define the region and help to shape the local climate. The Niagara Escarpment is approximately 1 million years old. It is such a unique ecosystem that in 1990 UNESCO designated it a World Biosphere Reserve. And in the past 200,000 years several ice ages have left their mark on our region. As the giant ice sheets covered the land and retreated, over and over again, the soil underneath became more and more complex and diverse. Soil maps of the area are anything but straight forward. But that’s part of what makes Niagara so interesting for growing fine wine grapes. Add to that the climate. Sitting near 43° latitude Niagara is considered a cool climate viticultural area; like the classic regions of Champagne and Burgundy in France. This means we get winter but we also get beautiful, hot summers with plenty of sunshine. Then, around harvest time, the temperature difference between the day and night is wide enough to allow the grapes to “rest” at night. This is why our wines have beautiful structure, finesse and tremendous aging potential. Château des Charmes has Chardonnay planted on each of their four vineyard sites in two distinct sub-appellations and make six different styles of Chardonnays; ranging from Blanc de Blancs sparkling wine, to unoaked Musqué (clone 809) to two classic barrel-fermented & barrel aged single vineyard Chardonnays. Chardonnay is an excellent varietal to showcase the range of flavour profiles Niagara’s diverse terroirs can produce.